This trip was taken the first weekend in August to celebrate Clayton's birthday. He is the owner of Big Boyz Toyz, a cycle shop here in Boise. This ride, in one form or another, has occured at almost the same time each year for the last seven. We started out Saturday morning at Big Boyz Toyz. A couple of cops drove by before we left, probably wondering what 30 bikes are doing out early Saturday morning. Duh. Once the smell of pork cleared out, so did we. 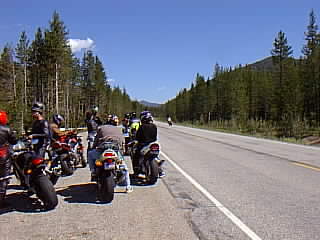 We took off towards Sun Valley by going up Idaho's Highway 21. It starts by going up Lucky Peak and on through the mountains. Very twisty road and in pretty good condition. We stopped every once in a while for gas or to let people catch up. Of course, at this point it doesn't look twisty, but, I assure you, it is. For more action hit this spot.